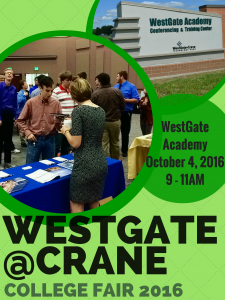 July 27, 2016- The 2016 WestGate@Crane College Fair will be held at the WestGateAcademy Conferencing and Training Center on Tuesday, October 4th from 9:00 AM to 11:00 AM. Not only does the fair provide students with information on surrounding colleges and universities, but $3,000 in scholarships will also be given away. 800 students and 30 colleges and universities attended last years event, making the fair a huge success for the region. We hope to see even more participants this year. 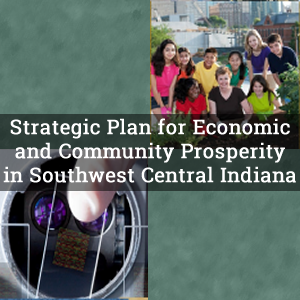 For more information and to fill out the registration forms for the event, please see the links below. Submit the form by Friday, September 23rd in order to ensure your reservation for the college fair.